As a backdrop to the marvellous account of the avatars of Lord Dattatreya, Sree Guru Charitra presents a comprehensive resume of the whole of ancient Indian philosophy of life. It envisages human life as a search for lasting contentment, peace and bliss as a struggle for complete unfoldment of its vast spiritual potential. All of Man’s endeavours derive ultimately from this aspiration. Many fail to realize these goals in life owing to lack of proper understanding of Man’s innate nature and his relationship to the rest of all existence of which human life is but one manifestation. Only when man understands the nature of the material universe as the manifestation of the One Universal Spirit and accordingly orients his life to it at the three levels of understanding, word and deed, can he hope to attain his goal. Those who succeeded in accomplishing this task have out of their spontaneous compassion for suffering humanity, enjoined a way of making all of one’s life a single-minded pursuit of this goal, moulding all of one’s natural instinctive drives to contribute to its realization. Thus the proper way of life is viewed as one continuous sacrament and ritual, made up of a series of several such, befitting the various stages of human life. Such a view of life derives from a direct experience of the spiritual process that underlies the nature of all existence from moment to moment, gained by the Enlightened Ones. Ancient Wisdom views the First Cause as the Nameless, Formless, Universal consciousness or the Spirit. The fundamental nature of this universal consciousness is to manifest the alternating states of activity and rest. The Pure Spirit was called the Parabramhan; Its dynamic aspect is called Prakriti. The whole of nature we see around us, from the distant nebulae and galaxies down to the smallest “particles” and “fields” of modern Physics, constitutes Prakriti and its play. At the end of every active phase comes the state of total is solution of all material existence and the two states are figuratively described as the “sleep and wakefulness” of Bramha, the Creator. In these are involved many sub-phases or cycles of time called ‘Kalpas’, each bearing its own name. For instance, the present one is called the Svetavaraha Kalpa, literally ‘the kalpa of the white Boar’. Each Kalpa is sub-divided into Manvantaraseach having its own universal law-giver or Manu. Each Manvantara is again sub-divided into the sequence of fourYugas, of which there is a definition in Sree Guru Charitra. At every phase of Total Dissolution or Pralaya, all the living creatures and all other aspects of the previous active phase of material existence are said to recede into a dormant state in a subtle form, just as all our feelings, thoughts and knowledge lie dormant in our individual consciousness during deep sleep. When we wake up, all these re-emerge into manifestation. So does it happen with the recommencement of the active phase of the Universal Spirit. Every active phase of the Universal consciousness is said to begin as a stir in the Divine Will (The Word, as the Bible puts it) to manifest Himself as the Many. According to Indian Scriptures, the first to be created are spiritual principles called the four Brahma Manasa Putras (the spiritual offspring of Bramha, the creator) who chose to remain forever as such, ie., as fully enlightened sages and not get entangled. In the next phase of the active cycle were projected the Prajapathis (lit. The progenitors of material creation and living creatures) and sages like Atri who willingly chose to further the divine plan of creation. 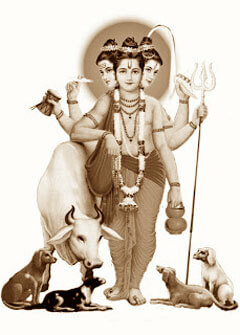 Then were projected the various conscious forces in nature described as gods by the Vedas. The rest of the material creation is a product of the collective, harmonious functioning of these conscious principles, described as the Yagna. The whole of the active phase or Prakriti is characterized by three modes of functioning of the cosmic energy – Sattva, Rajas and Tamas which can be described as Harmony, Activity and Confusion. After the evolution of the material universe, including the earth, with all its flora and fauna, sages like Atri manifested themselves on earth in human forms and propagated knowledge of the fundamental creative processes among mankind. This body of knowledge is the Veda which later came to be classified into the four Vedas. The sages also tried to impart all this knowledge to as many as possible through religious philosophy, metaphysics and ritual. The whole process of creation, of which Man is a part, was presented as a spontaneous, joyful, creative process of self-fulfilling activity with no other aim or goal. Man can live in harmony with the rest of creation and with his own self (which is basically a manifestation of the cosmic or universal process) to the extent that he grows in this realization and he can thus transcend all those narrow, selfish concerns which shut out such understanding and which are, in their turn, products of lack of such an understanding.